Many think that electronic health records (EHR) and electronic medical records (EMR) are the same, but there are important differences. Electronic medical records have been around longer and are focused on the diagnosis and treatment of medical conditions carried out by a single provider. Meanwhile, electronic health records are specifically designed to be shared or transferred. What are Electronic Medical Records? Electronic medical records are the digital equivalent of old-fashioned paper medical records. They allow doctors to track data on patients associated with their practice. Some major applications of EMRs include identifying which patients are due for preventative screenings, vaccinations or check-ups. They are a useful tool for tracking quality of care–making them useful business intelligence tools–but they don’t easily allow information to be transferred to other health care organizations. Electronic health records fulfill many of the same purposes as EMRs, but they have a much stronger focus on the individual patient. Electronic records are designed to transfer easily between health care organizations when the patient moves or starts seeing a new provider. Health care providers can easily share information using this type of record. Further, providers can benefit from implementing an EHR system from the EHR incentive program. As a result, EHRs build up a much broader picture of a patient’s overall health, whereas EMRs held by single providers often focus on particular medical conditions. 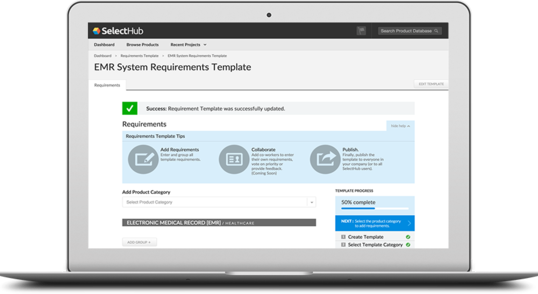 Read more on EHR system requirements. EMR software allows you to enter information about a patient’s medical care, including test results and prescription medications. You can use this kind of software to issue repeat prescriptions, schedule appointments, and bill patients. EHR software also allow e-prescribing, but also provide communication features to allow health care providers from different organizations to collaborate in patient care. Should You Use EHRs or EMRs? If your health care organization regularly needs to share information with other health care providers, then using a certified EHR technology is an excellent decision. For example, if your health care practice regularly refers patients for tests or consultations with specialists outside of your practice, then it is highly beneficial for each patient to have an electronic health record. However, if your practice is self-contained and focused on treating a particular medical condition, then an EMR system may be a simple and adequate addition to the suite of business intelligence tools you use to run your health care business.